I am surprised no one talked about this car. especially the AMG model. It is priced sub 50k which is Evolution STI price range. sounds like what AMG's fans love ? Any ETA on the 'A' and "CLA' class? Always tempted to buy some "i"s from local rice shops and add stick it after CLA.. especially those in Richmond. The performance is very good, 0-100km/h in 4.6 seconds. Price is going to be mid $50s, which is priced right, $10,000 less than the C63. CLA will arrive some time this month or early next month. I thought I saw one at the Richmond, Granville/No. 3 Road Petro Canada gas station. The front LED daytime running lights looked like the CLA + the diminutive size. The front LEDs look similar to the ones used in the current Audi A3, but with more curves to it (i.e. the CLA LEDs were more feminine). I can't get over how the trunk swoops downwards like a godzilla stepped onto its trunk. 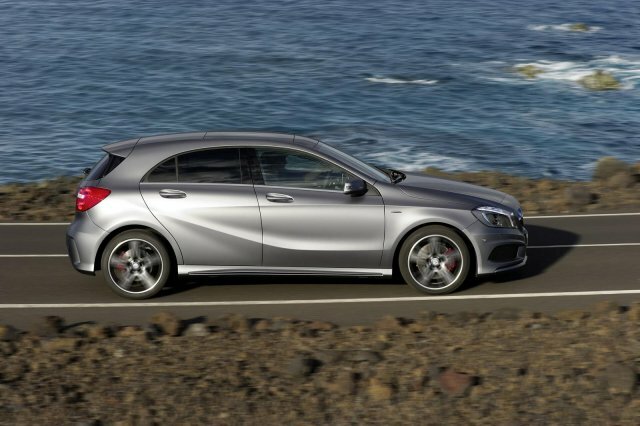 The A class hatchback looks a lot more coherent. And I guess it's not available in Canada. You guessed correctly. A class and CLA class shares the platform but CLA is what the marketing department thinks we like better. Much like how our BMW 1 series is coupe only but you can get hatchbacks in Europe. the A class and 1 series hatch are everywhere in Europe. and both look pretty good, esp the A-Class. would get diesel for daily.